Christian Democrats leader Sari Essayah says her party’s family-focused policies could appeal to Muslims in Finland. Speaking on HSTV’s weekly English-language current affairs show Newsmakers, Essayah says many of her party’s supporters ”have close connections to churches and religious communities” and that the party’s values are based on Christian values. ”When it comes to family policy, I would say that for a Muslim voter, Christian Democratic family values are maybe the closest one” says Essayah. When asked whether she thought Muslims would want to vote for her party, she replied ”why not”. ”We are for freedom of religion, and we see [that] all religious communities [are] very important for society”. The party current enjoys most of its support from older voters, primarily in the small towns of the Finnish countryside, but Essayah is open to the idea that new immigrants could be attracted to the party’s more traditional, family-focussed values-based ideology. Turning to Britain’s upcoming referendum on whether to stay in, or leave, the European Union – the so-called ’Brexit’ – Essayah says that from a Finnish perspective ”it would be quite harmful if Brexit happens”. ”The EU is needing Britain for commercial cooperation, we are like-minded countries, Finland and Britain”. ”Britain is one of the biggest net payers in EU […] if Brexit happens, it would mean that Finland has a lot bigger share of the EU budget to cover”. The Christian Democrat party, says Essayah, shares a lot of the same concerns as British Prime Minister David Cameron’s Conservative party: wary about Brussels imposing too many rules, red tape and legislation on individual countries. ”We see the European Union as a good platform for cooperation between the independent states”, says Essayah, but similarly to Cameron, thinks that ”there are a lot of things we can do better at a national level”. Sari Essayah was on Friday unanimously elected the new chair of the (Suomen Kristillisdemokraatit Christian Democrats of Finland). The Lapinlahti parliamentarian succeeds former Interior Minister Päivi Räsänen at the helm of the party. A vote was deemed unnecessary following the pulling out of the second candidate Sari Tanus from the race. Tanus is Member of Parliament from Tampere. Essayah said now is the time for new political openings citing economy, the question of employment as well as EU and family issues as important to her agenda. Essayah attributes the party’s weak approval rating to the legacy of the previous government which the Cristian Democrats were part of. More than 600 delegates took part in the convention in Savonlinna. MEP Sari Essayah calls on the Finnish Minister for Foreign Affairs to appeal to the Sudanese authorities to reverse Meriam Yehya Ibrahim Ishag’s death sentence. Last week a sudanese court sentenced 27-year-old Meriam Yehya Ibrahim Ishag to 100 lashes for adultery and death by hanging for apostasy because she refused to recant her christian faith and convert to islam. Ms Ishag is eight months pregnant and has been held in custody with her 20-month-old son. Ishag’s father is a muslim and her mother is a christian. According to Ms Ishag, she has always been a christian. According to the sharia law which has been in force in Sudan since 1983, Ms Ishag is a muslim according to her father’s religion and renouncing that faith amounts to apostasy which is punishable by death. Furthermore, in Sudan a muslim woman’s marriage to a non-muslim is regarded as adultery and is punishable by lashes. Ms Essayah points out that Ms Ishag’s sentence is a flagrant violation of international human rights norms according to which the freedom of religion includes both the right to choose one’s religion and the right to be free from any coercion which impairs this right. Sari Essayah is a Member of the European Parliament for the European People’s Party in Finland. Although better known for being a world-championship winning race-walking athlete, she has had a life-long connection to cycling. 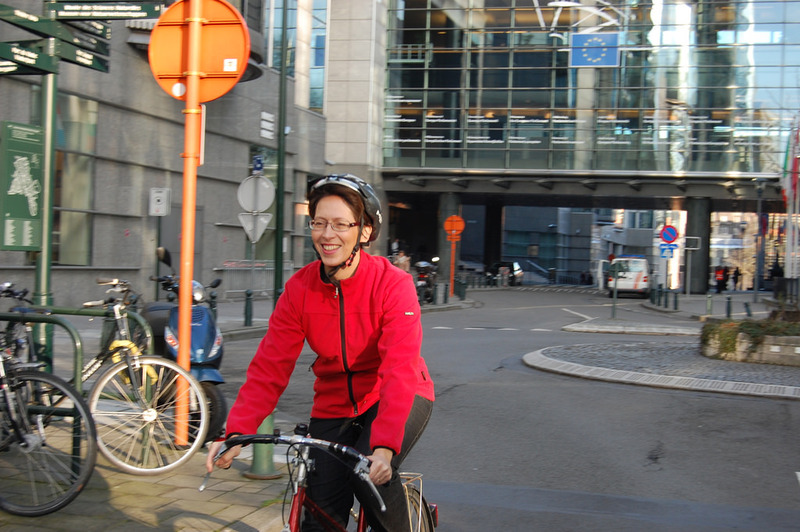 After she and her party supported the inclusion of references to cycling and EuroVelo in the regulations for the Trans-european Transport Network (TEN-T), we caught up with her at the European Parliament to talk about her life as an everyday cyclist. Why did you and the EPP support the inclusion of a reference to cycling in the TEN-T (Trans-European Transport Network) regulations? Why should more European funding be made available for cycling? SE. As you can tell from my background, growing up using a bike, for me, cycling is for every day. Just as other methods of transport – roads, rail, shipping have their place in TEN-T, cycling has its place too. It’s good to note that the EPP is also a climate friendly party. Investment in cycling is obviously important from the perspective of climate change, but I find the thing that most people care about is the quality of air in cities. Investment in cycling can improve everyone’s quality of life in this way. If people haven’t grown up with cycling as a day-to-day means of transport they may be quick to dismiss it as a sport or a leisure activity. For me it is quite natural that it is also a very good way of getting around. MEP Sari Essayah (Finnish Christian Democrats, EPP) rejects euthanasia as the answer to the end-of-life debate. Rather, the Finnish MEP calls for the further development of palliative care and its better integration into public health care systems across Europe. “In those countries where active euthanasia has been legalised, the level of palliative care has suffered as a result. Rather than legalising an activity which is considered unethical by the World Medical Association as well as the Hippocratic Oath, we must take deliberate steps to develop the quality of treatment given terminally ill patients”, says Ms Essayah. Ms Essayah is also concerned about the trend of the so-called “right to die” lobby to advocate the legalisation of active euthanasia in more countries across Europe as well as to campaign for its widened application in the few countries where the practice has already been legalised. This worrying development would extend the possibility of euthanasia to non-terminal patients, those suffering from mental illness as well as children. “These campaigns on the one hand stress the importance of safeguards which limit the application of active euthanasia. On the other hand, they simultaneously campaign for the relaxation of these safeguards in countries such as the Netherlands, Belgium and Luxembourg, where active euthanasia has been legal for some years already. I am extremely concerned about the devaluation of human life which is implicit in this trend, “said a concerned Ms Essayah, speaking at an event at the European Parliament on Wednesday 13th November. MEP Sari Essayah spoke at an event at the European Parliament launching the Euthanasia Prevention Coalition – Europe, which is an organisation formed by a number of NGOs from across the continent. The aim of the coalition is to speak out for the many who are concerned about the trend to undermine the value of human life and dignity through the legalisation of active euthanasia. Finnwatch, a Finnish non-profit research organization, has released a short documentary film highlighting consequences of its January 2013 report on the responsibility of private label products originating from Thailand. The interview of Mrs Essayah at 6:26 on the document video. EPP conference on Youth Employment calls for greater engagement and funding to improve job prospects, particularly in member states hit hard by economic crisis and austerity measures. Also Mrs Sari Essayah MEP from Finland is interviewed. Sari Essayah is no typical E.U. parliamentarian. The bespectacled Finn is a retired world-champion race walker, who inherited her distinctly non-Finnish family name from a Moroccan father. And while Essayah had little contact with her father growing up, something of the Middle East and North Africa appears to have stayed with her: She has become one of the European Parliament’s go-to legislators on the region. Essayah first entered Finland’s parliament a decade ago, representing the Christian Democrats. In 2009 she moved her family to Brussels to join the European Parliament (EP), the EU’s 754-seat lower house of legislature (its upper house is the 27-member Council of the EU). Today she is a member of the European People’s Party, the center-right alliance that is the EP’s largest voting bloc. The 46-year-old is member of the parliament’s delegation to Israel, and of European Friends of Israel, an umbrella group of pro-Israel national caucuses that numbers some 300 legislators. She is also a member of the EU delegations to the Maghreb (North Africa) and to the Union for the Mediterranean – a grouping of Mediterranean Basin states that includes Israel and all of its neighbors. ”SEPA is extremely important for Europe’s Internal Market. This is very good news for the European Union”, said Sari Essayah MEP, EPP Group Rapporteur, after her Report on the technical requirements for credit transfers and direct debits in Euros was adopted today at the plenary session of the European Parliament. In the future, there will be no need for companies and individuals to have several bank accounts within the single payments area. Within the SEPA, consumers can transfer money as easily to another account in another Member State as to an account in their own Member State. The deadline for the changeover to the new system for both SEPA credit transfers and direct debits will be 1 February 2014. However, the same deadline will be 30 October 2016 in those Member States who are not part of the Eurozone. From 1 February 2014 onwards, common standards are required to be used by all banks, most importantly where IBAN and BIC codes are concerned. ”There are a lot of benefits for consumers in the SEPA: using a debit card anywhere in the Eurozone, direct debit from anywhere in the Eurozone, lower prices for basic payment services in high-cost countries, transparent pricing and no hidden charges, to mention only a few of the benefits”, said Sari Essayah. Gilad Shalit, kidnapped by Hamas armed forces in June 2006 on Israeli soil, has been kept hostage for almost 4 years with continued disregard for his basic human rights. ”The situation of Gilad Shalit is a humanitarian issue and the Joint Resolution of the political Groups underlines the fact that since being taken hostage nearly 4 years ago, he is kept in an unknown place in Gaza where he does not enjoy basic rights according to any humanitarian standards, including the 3rd Geneva Convention”, she said. ”It is from this humanitarian perspective that we demand the immediate release of Gilad Shalit. Meanwhile the minimum requirement is that the Red Cross and Gilad’s parents may be allowed to be in contact with him”, Essayah demanded. ”Gilad Shalit should not be made a bargaining chip by the terrorist organisation Hamas but should be released immediately. This is the message that the EPP Group wishes the High Representative Lady Ashton to take with her to Gaza during her forthcoming visit”, she concluded. Members from all political Groups in the European Parliament, except for the GUE/NGL Group, have signed a letter sent to Lady Ashton requesting her to raise the case during her visit to Gaza scheduled for Wednesday 17 March. Sari Essayah MEP had invited Gilad Shalit’s father Noam Shalit to visit the European Parliament this week to inform Members of the case. During his visit, Mr Shalit met with the President of the European Parliament, Jerzy Buzek, and the EU’s High Representative for Foreign Affairs and Security Policy, Catherine Ashton. Terrorist organisation Hamas kidnapped 19-year old Israeli soldier Gilad Shalit in June 2006 on Israeli soil. Since then he has been held in captivity, completely isolated, in an unknown location in Gaza. Hamas has released a video tape of him as proof of him being alive. Negotiations on Gilad Shalit’s release have been conducted on several occasions. The latest request was to free 1000 Palestinians, among whom many have carried out terrorist attacks, from Israeli prisons. Gilad Shalit is a European (French) and Israeli citizen. After the kidnapping, he was granted Italian nationality as well. 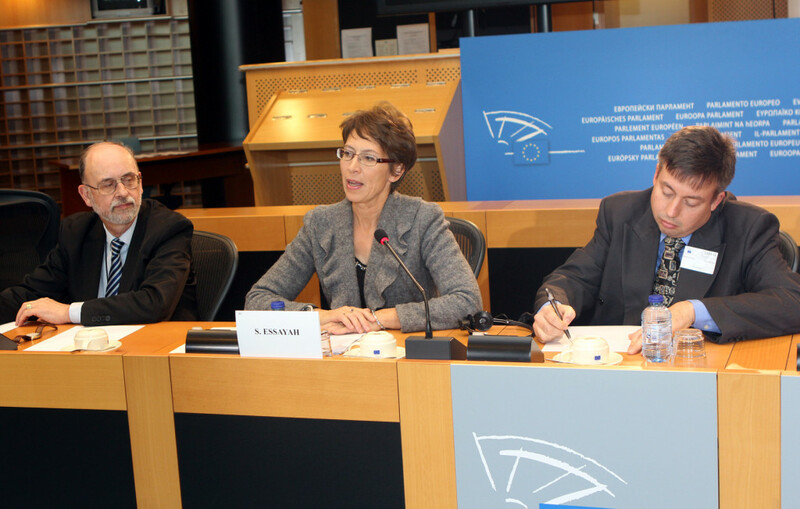 Sari Essayah MEP participated in the European Parliament’s Delegation visit to Israel in February. During this visit, the EP Delegation met with Gilda Shalit’s father, Noam Shalit, who has now visited the European Parliament.